Foreigners who hadn't fled, including a vast population of Americans, soon began trying to leave. President Jimmy Carter said "we stand ready to work with" Iran's new leaders, slowly loosening America's long embrace of the shah as its main Mideast ally. 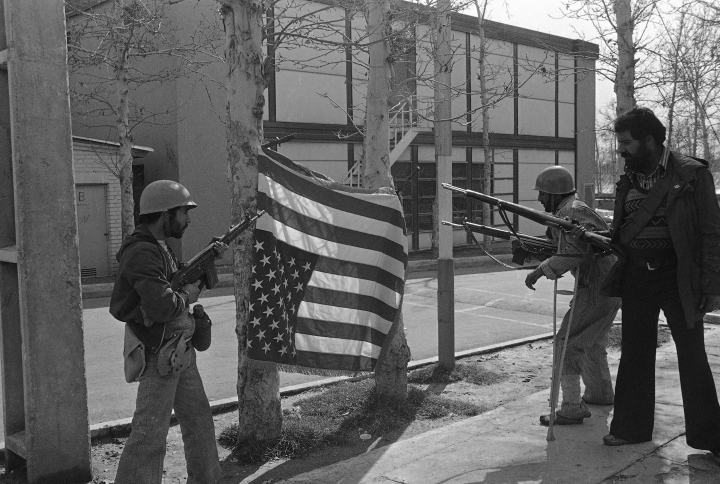 However, the revolution and Carter's decision to allow the shah to seek medical treatment in America would spark the U.S. Embassy takeover and hostage crisis, stoking the animosity that exists between Tehran and Washington to this day. Now, 40 years later, The Associated Press is making its story and historic photographs of Iran's Islamic Revolution available. The story has been edited for typographical errors, but maintains the AP style of the day, such as using "Moslem" as opposed to Muslim. TEHRAN, Iran — Prime Minister Shapour Bakhtiar reportedly resigned Sunday after Iran's military chief ordered troops back to their barracks and declared support for Moslem Leader Ayatollah Ruhollah Khomeini. The government's news agency placed the death toll in Tehran at more than 200 with scores killed in other cities during two days of bloody street fighting. Khomeini's followers took over Tehran Radio and issued a series of directives from the Provisional Revolutionary Government. The broadcast said Bakhtiar's government had fallen and all members of parliaments had resigned. They also reported fighting continued in some cities but urged Tehran residents "to refrain from attacks on the armed forces now that the revolution has triumphed and the armed forces have surrendered." Gen. Abbas Gharabaghi, chief of staff of the armed forces, met with Khomeini's Prime Minister Mehdi Bazargan, 70, and said he would support the government set up by Khomeini to establish a "revolutionary" Islamic republic. Insurgents took over Tehran, looting military posts of weapons and ammunition, occupying government buildings and police stations and racing through the street flashing "V for victory" signs. They raided several prisons and released "political" detainees jailed by the shah as common criminals. Early Monday, a huge explosion shook the western side of the city near Mehrabad International Airport. Tehran Radio said Jay Barracks, one of Iran's largest bank garrisons, was in flames. The radio reported heavy shooting there, in Majlis Square and two other areas of the capital. Ebrahim Yazdi, Khomeini's chief aide, said Bakhtiar had quit. In one of its first acts, the Provisional Operational Staff of the Islamic Revolutionary Movements closed Iran's borders and all airports for 24 hours beginning Monday, Tehran Radio said. State Department spokesman Kenneth Brown said the 7,000 Americans in Iran are safe "to the best of our knowledge." In Marrakech, Morocco, sources close to Shah Mohamad Reza Pahlavi, 59, said he was in state of "anguished expectation" as he followed events in Iran from his "vacation" seclusion here. They said he was following (news from) U.S. and European Embassies. In a radio and television address, Bazargan said he was pleased to hear "the army will not interfere in political affairs and that they have supported the will of the people." The military decision to follow "the will of the people" and return to their barracks came after two days of bloody rioting in which many soldiers joined the opposition. The violence left more than 200 dead and 800 wounded. 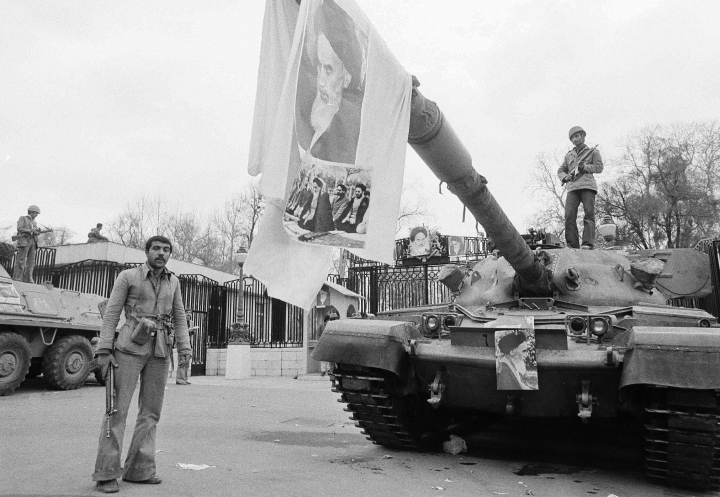 The military defections to Khomeini's side exploded the notions that the armed forces were united behind the government. The 78-year-old religious leader, who returned to Iran Feb. 1 after 14 years in exile, declared in a statement "victory is near." 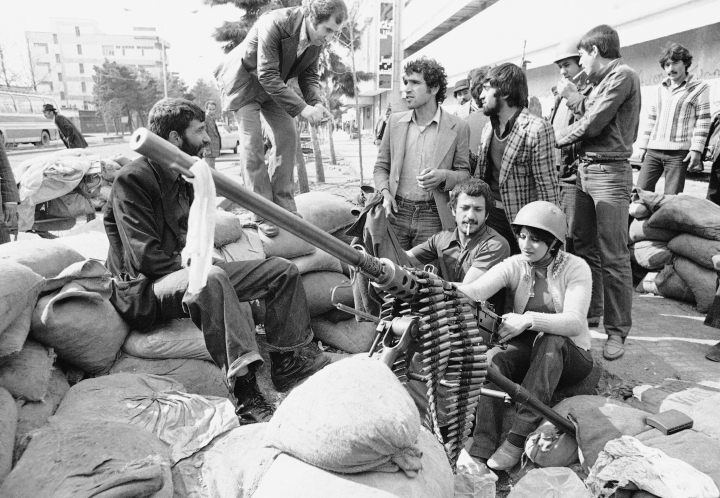 The decision to pull back the troops followed a weekend of vicious fighting between Khomeini's followers and government troops for control of police stations, government offices and other landmarks in the city. In a recorded radio message, Khomeini asked his followers to "prevent any anarchy and chaos and not to allow ill-intentioned troublemakers to engage in plunder, arson, punishing the accused and destruction of private or public property . and make the movement look barbaric and reactionary." 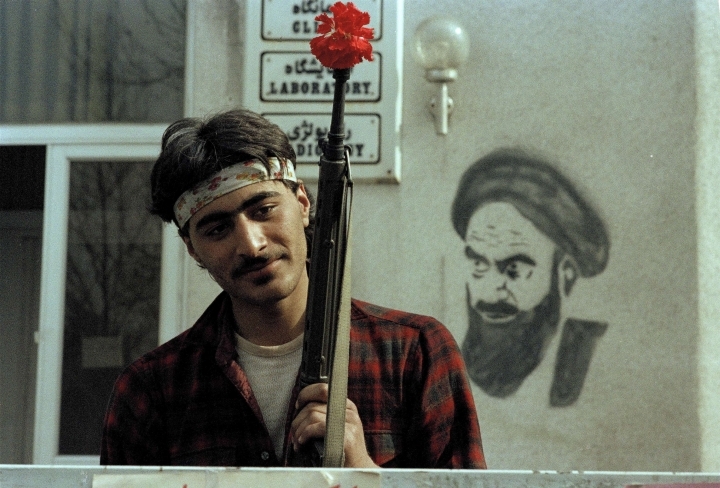 Khomeini said the enemy "still has resources for all manner of intrigues and plots." Yazdi said the former chief of the shah's feared secret police force SAVAK, Gen. Nematollah Nassiri, had been taken prisoner along with former Prime Minister Amir Abbas Hoveida. Also arrested was Tehran's military governor, Lt. Gen. Mehdi Rahimi. Insurgents attacked Bakhtiar's office hours after the army pulled back its forces, but aides said the 62-year-old prime minister was not there but would not say where he was. "The armed forces with all its power supports the wishes of the people," said a statement broadcast by Iranian state radio. "The commanders of the armed forces held meeting at 10:20 this morning and decided in order to prevent chaos and further bloodshed to declare the armed forces' neutrality and therefore the units of the army were ordered to return to their barracks." The 430,000-man armed forces had been the Bakhtiar government's major source of support. The ayatollah, spiritual head of Iran's 32 million Shiite Moslems, demanded Bakhtiar resign so Iran could be transformed into a non-aligned Islamic republic. Khomeini leads the religious opposition that feels the shah's "westernization" of Iran has eroded Islamic values. Also opposing the monarch is a rising middle class which has demanded more say in the government. 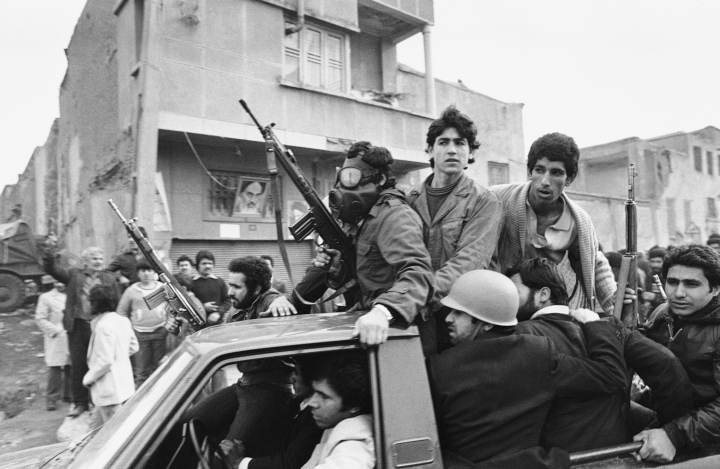 At 5:45 p.m. the state radio said it was in the hands of Khomeini followers. An announcer proclaimed the radio "the voice of the revolution, the real voice of the people of Iran,"
Huge crowds jammed the narrow, winding streets around Refah School, Khomeini's headquarters. Reporters there were told 16 soldiers and a colonel were taken prisoner when insurgents stormed the Ministry of Commerce. Insurgents sacked the headquarters of the Israeli Trade Mission and erected a sign that said "Embassy of the PLO" — the Palestine Liberation Organization. 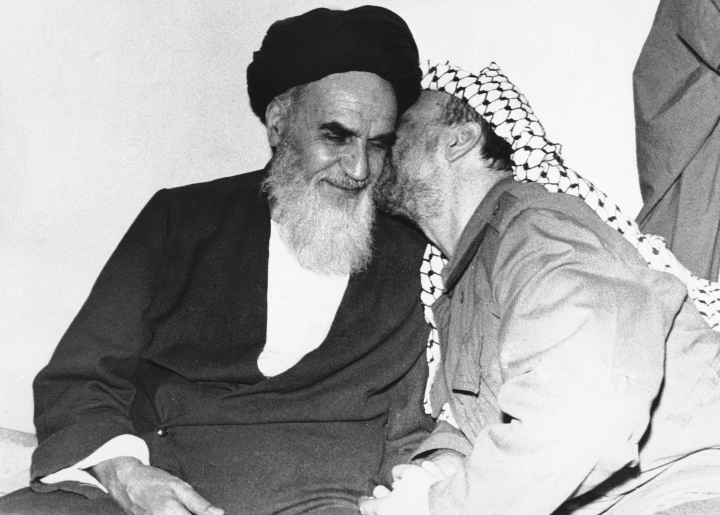 PLO Chief Yasser Arafat in Beirut, Lebanon, sent a message to Khomeini saying: "I pray to Allah to guide your steps on the path of faith and jihad holy war in Iran."